Discounts on already affordable wedding invitations? Yes, please! 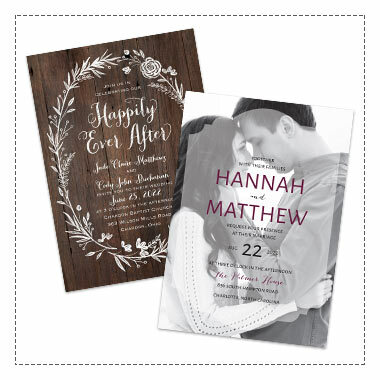 We want to make sure your wedding invitations are as inexpensive as possible. That's why Ann's Bridal Bargains coupons and promo codes are available every day. Use these everyday discounts to save on your wedding invitations, save the dates, wedding programs, wedding napkins, thank you cards and so much more. Congrats on your Engagement! Happy Wedding Planning! Use code JOINUS at checkout. Only one promo code may be used per transaction. INVITATIONS 99¢ OR LESS EVERY DAY! We offer the lowest prices around! Prices vary by card and are subject to change. Site promotions may be used on these low prices.